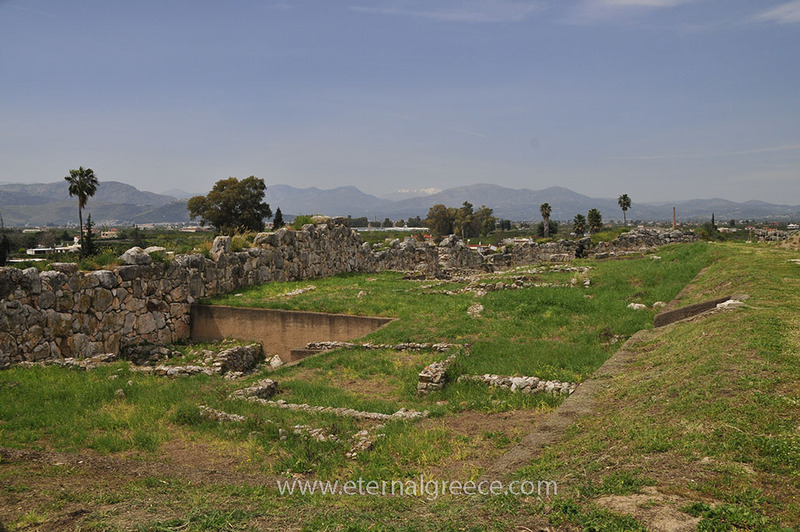 On the road from Argos, around 15 km from Mycenae and just outside the town of Nauplion (Nafplion), we can see the remarkably well-preserved Mycenaean archaeological site of Tiryns. 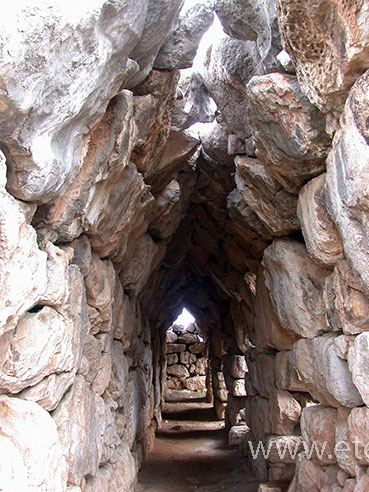 Though it is not so well-known to visitors as Mycenae itself, Tiryns was a major ancient settlement in its own right. Located close to the sea, it was built in a prime position to control trading routes between the mainland and the Aegean ports. 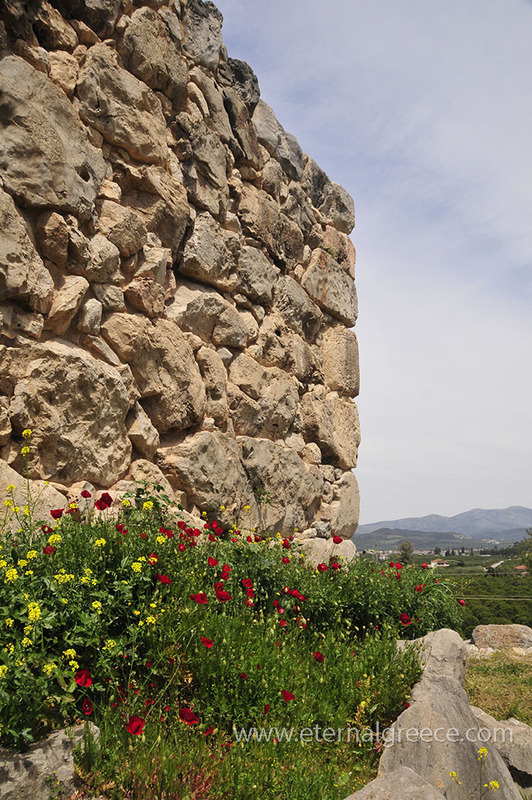 Steeped in history and mythology, Tiryns dates as far back as Neolithic times (around 5000 B.C.). 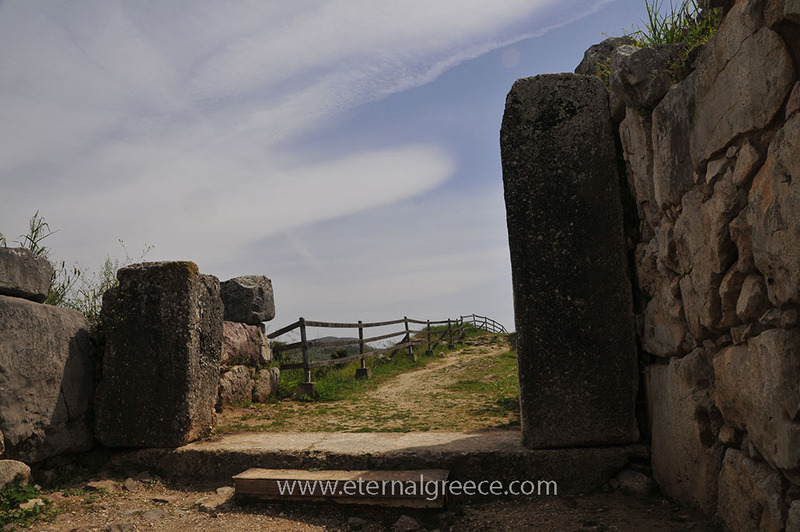 It has been strongly linked with many ancient Greek legends, especially those of Heracles (Hercules), with some sources claiming that the mythical hero was actually born here. 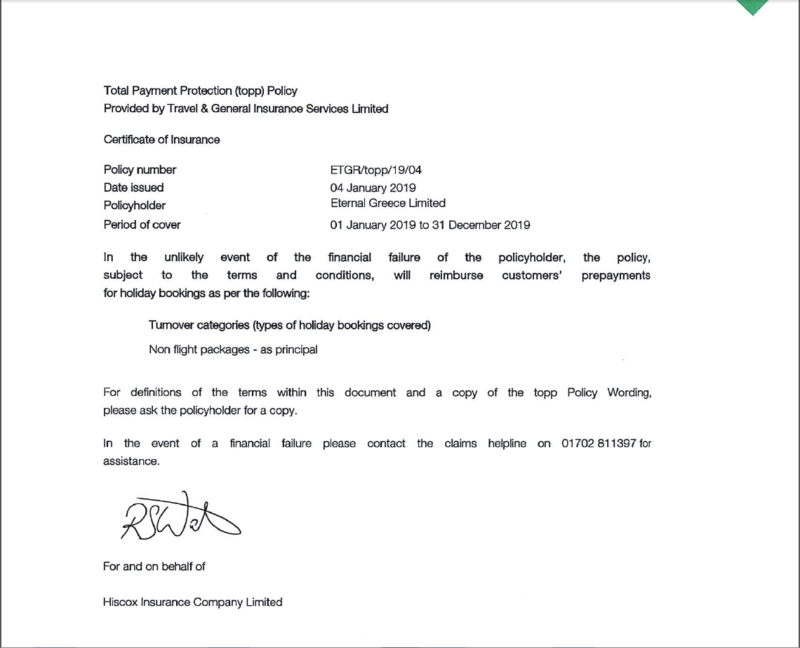 So it is not surprising that it has been on the UNESCO list of World Heritage Sites since 1999. 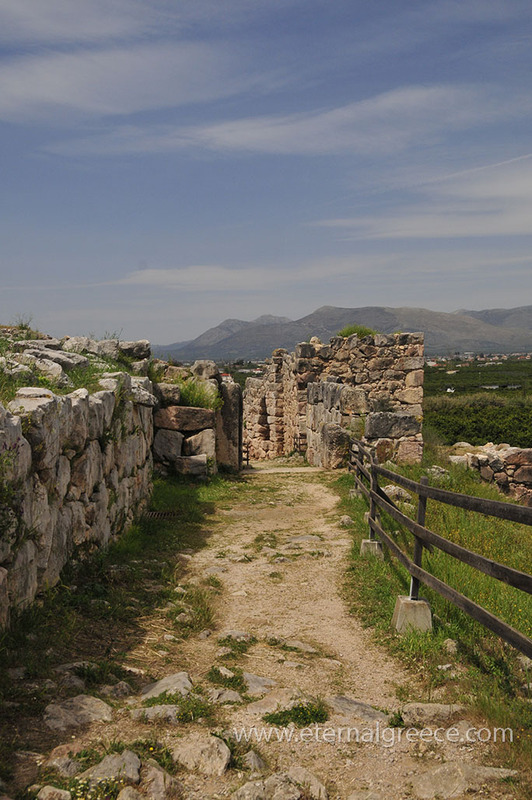 Tiryns was mentioned in the epic poetry of Homer around the 9th century B.C., and later by the Roman poet and mythographer, Ovid, among others. 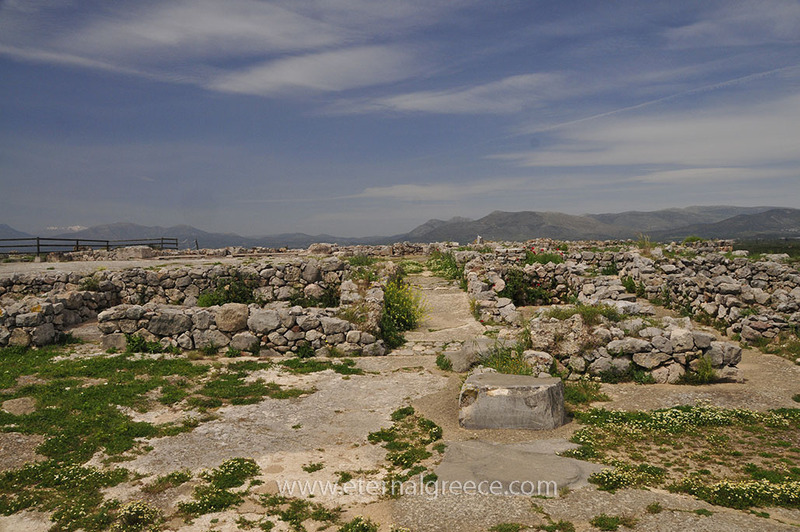 Legend has it that the citadel was originally built by Proetus (Proitos), who was the grandfather of Perseus, and twin brother of Acrisios. The twins had the reputation of having been enemies since they were in their mother’s womb! When they grew up, they fought over the kingdom of Argos and Acrisios won the throne. Proetus went off to Asia Minor, where he married the king of Lycia’s daughter, and then returned with a Lycian army to take over Tiryns. 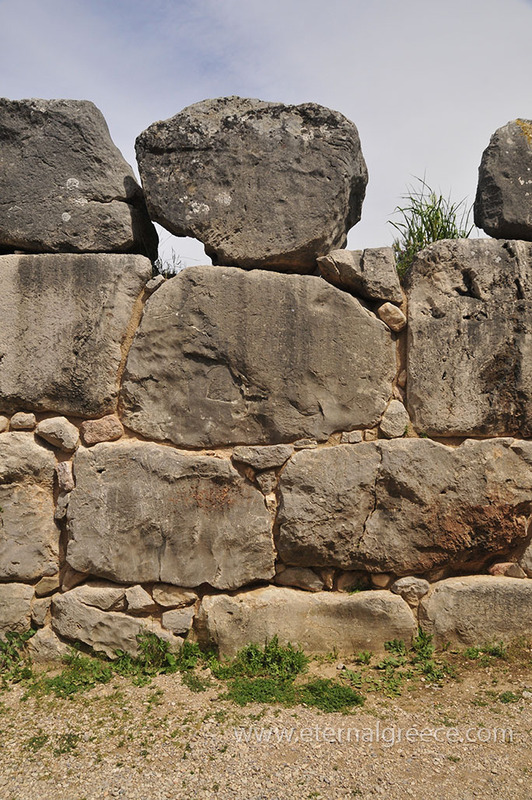 The ancient Greeks believed they must have had help from the Cyclopes, the notorious one-eyed giants of Homer’s Odyssey, to build such massive walls around the citadel. A couple of generations down the line came the turn of Perseus’s grandchildren to squabble over the kingdom of Mycenae. In response, Zeus declared that the next descendant of Perseus would be king, expecting this to be own son, Heracles. But the goddess Hera stepped in so that her favourite, Eurystheus, would win instead. She caused the premature birth of Eurystheus while ensuring Heracles’ birth was delayed. The family feuds continued. The brave Heracles killed his own family, then blamed his fit of madness on Hera. This triggered King Eurystheus’ plot to get rid of Heracles, setting him the twelve Labours as a punishment. When Heracles returned alive wearing the skin of the Lion of Nemea after the first Labour, Eurystheus hid in a huge storage jar that may well have been within the Cyclopean tunnels of Tiryns. 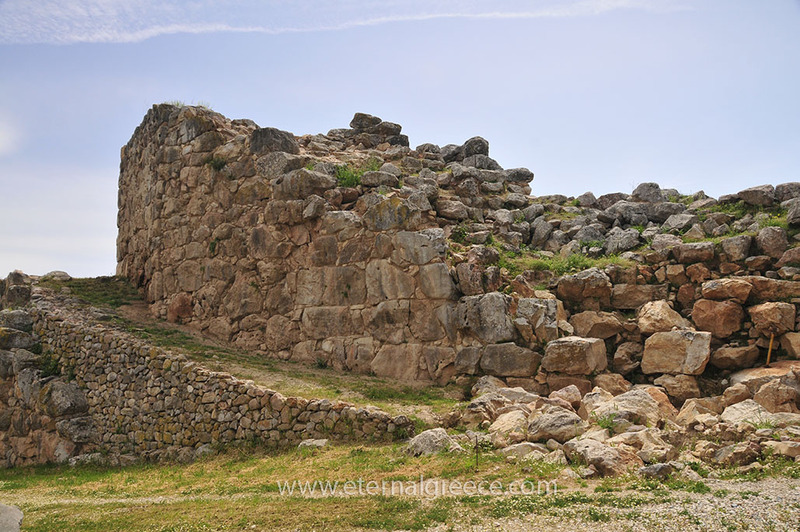 Pausanias, the famous Greek geographer, visited Tiryns on his travels in the 2nd century A.D. and added some geographical context to the Homeric legends. 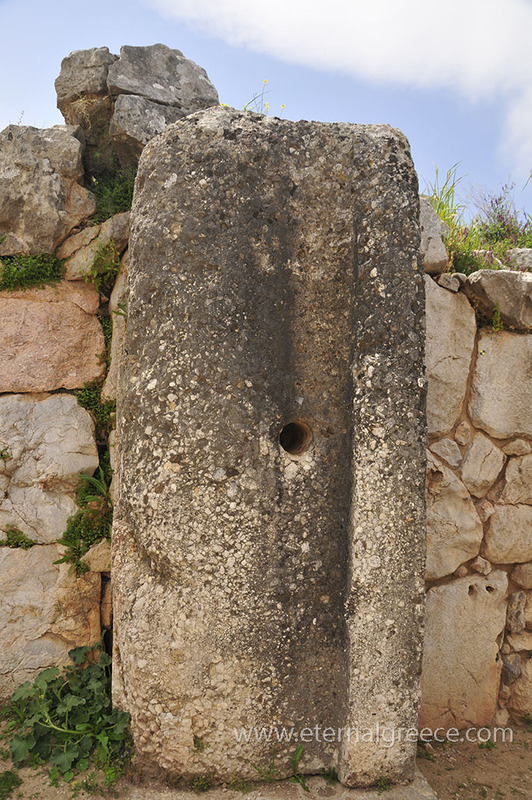 He supported the belief that the area had been occupied 2000 years before the Bronze Age. However, it wasn’t until after 1832, when Greece was freed from Ottoman rule and became a sovereign state, that German archaeologists began excavating the site and found evidence to back up the historical theories. 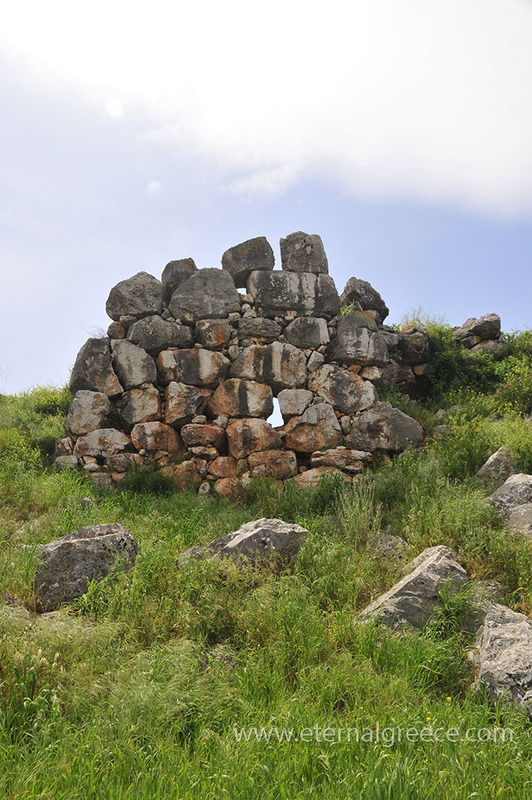 What we know for sure is that during the Early Bronze Age, around 2500–2000 B.C., there was a large circular building, most likely a palace, around 28 metres in diameter, which was surrounded by houses, on the top of the hill. Its base was made from two parallel stone walls making it up to 45 metres wide. 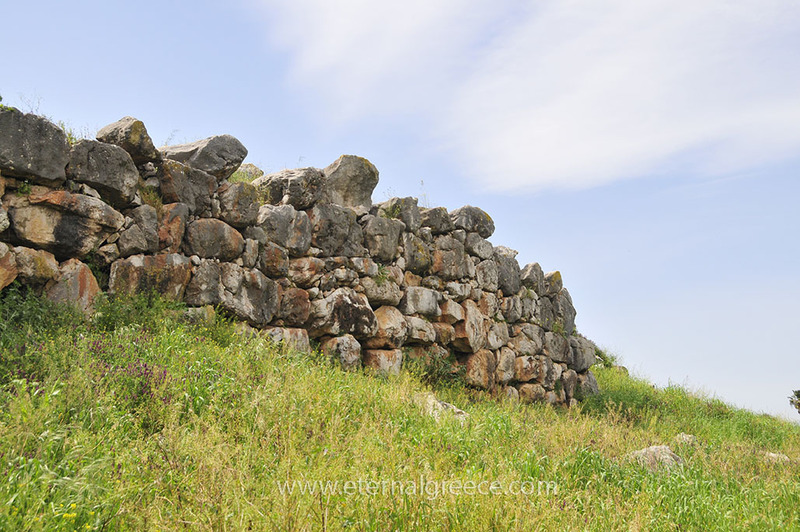 The Mycenaeans moved into Tiryns after 2000 B.C. and built the Acropolis of Tiryns in three stages during the 14th and 13th centuries B.C. 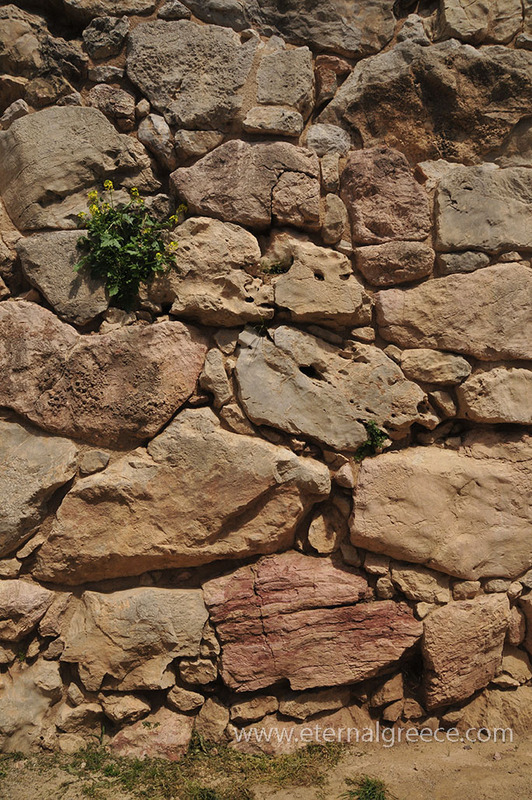 About 750 metres of walls surround the entire citadel. They are known as Cyclopean walls and are between 4.5 and 7 metres thick. Around these walls, the town extended on the plain below. 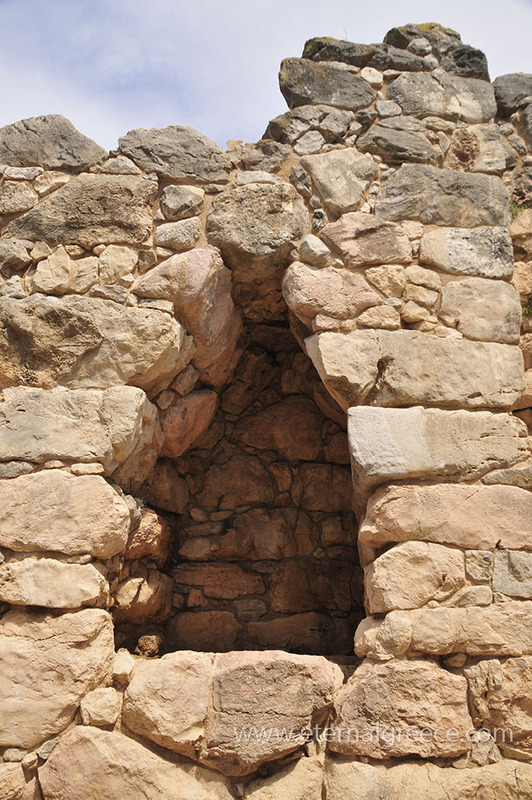 In the 13th century B.C., Tiryns suffered from earthquakes and the general downfall of the Mycenaean civilisation, though it was still active through the Iron Age. In 479 B.C., according to Herodotus, it sent 400 hoplites (foot soldiers) to the Battle of Plataea (Plataia) in Boeotia, where the combined Hellenic forces defeated the Persians, putting an end to their invasion of Greece. 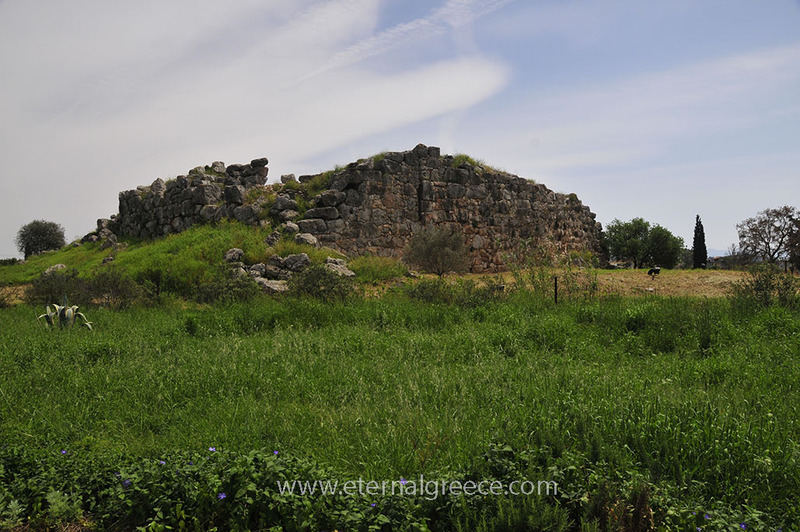 Argos finally destroyed Tiryns around 470 B.C., damaging the Hellenistic Temple of Hera which had been built on the Acropolis. A Byzantine church was later built in the ruins. 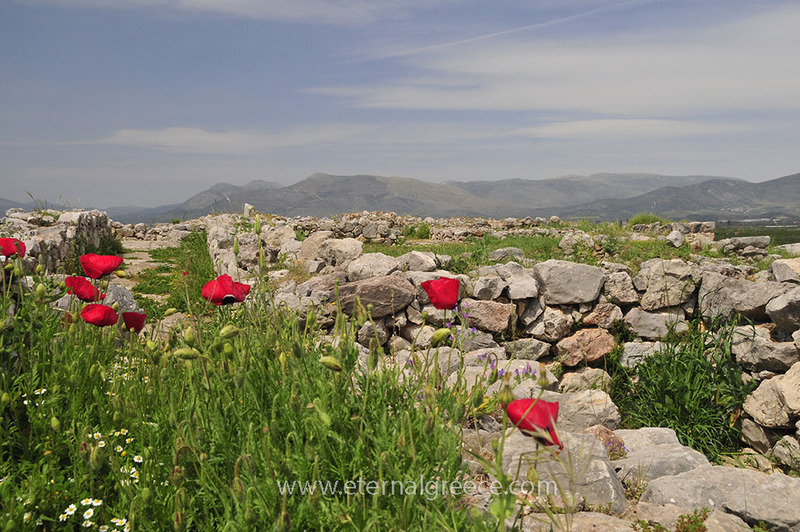 Despite the ravages of time, and some inadvertent damage done by Schliemann’s original excavations, there is still plenty to see and to fire the imagination as we walk up to the Acropolis and look down across the plain here. Enough of the stonework and the supports from the Great Gate of the Acropolis remain to give us a good idea of the vast scale of huge wooden door that was in the entrance. The impressive ramparts stand up to 7.5 metres high and 10 metres wide. 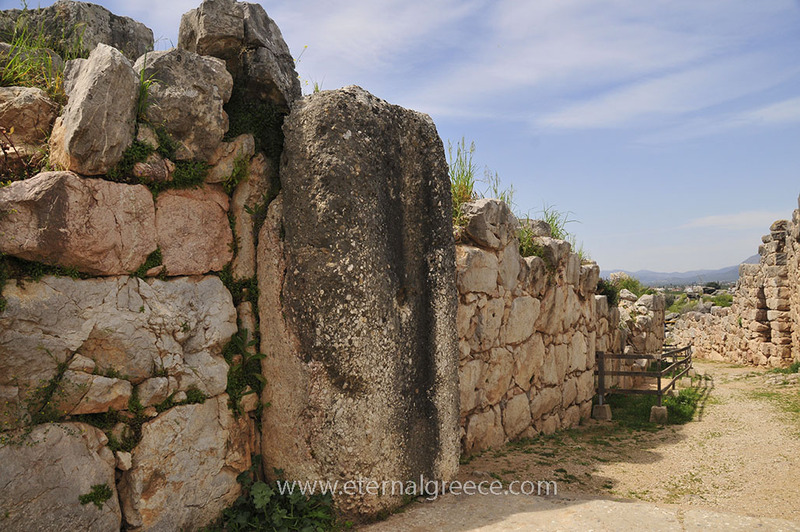 In the palace ruins, we can see the holes for the door hinges on the stone threshold. Then we come to the East Casemates, where we find a long narrow gallery in the ramparts, leading to six rooms which used as warehouses and barracks. Not much is left of the Propylaia, but archaeologists consider it important as its design was so similar to the Propylaia on the Acropolis in Athens. From the palace court, a staircase leads us to the South Casemates. The inner walls of the main room of the palace were decorated with alabaster panels, and ornate friezes. These were mostly hunting scenes and richly-dressed women of the court, some of which are on display in the Archaeological Museum in Athens. The floor was painted with intricate designs including sea creatures. To remind us of the level of civilisation, there is even a royal bathroom with drainage holes in the stone floor. 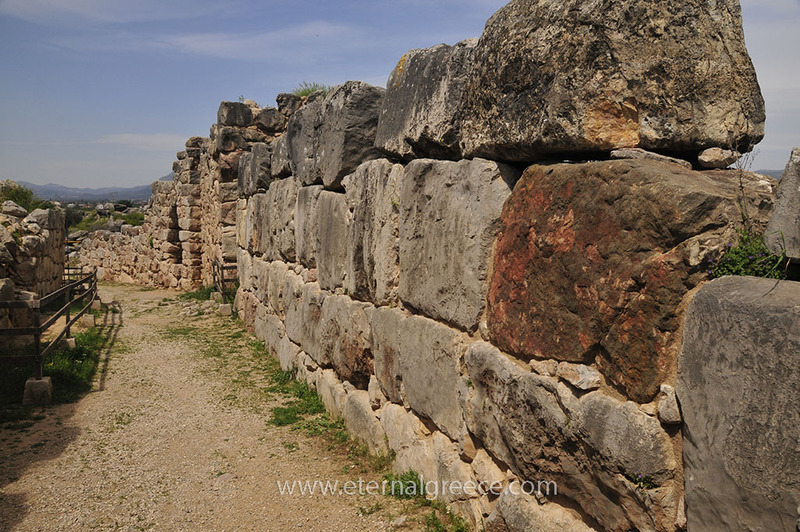 In short, our visit to Tiryns will thoroughly enhance our overall picture of Mycenaean life and ancient Greek culture in the Argolid (Argolis).